I've been helping Cisco customers (mostly Service Providers) in analyzing, planning, and deploying IPv6 in their network since 2007. I have provided both basic and advanced IPv6 training multiple times. And yet these days some people still ask question: why do we need IPv6? In more specific, if the question comes from Internet or Service Providers, the question would be: why do we need to invest in IPv6? There is comprehensive slide from our marketing team for that. No, I won't discuss that. Nor would I discuss about the alternative like carrier grade NAT or the recommended strategy to migrate IPv4 to IPv6. In today's reality, some customers are deploying IPv6 in the network because they are running out of public IPv4 address and they believe address translation is not the answer. Some customers are forced to deploy IPv6 by government mandate. For some, they are just following the trend to be on the leading edge. Some customers with superb business mindset are doing it because they are planning to launch new services or to open new business opportunities. But what does this mean to you as individual? Most mortals don't know about IPv6. They don't even care. If today you can browse the Internet, check your email, update your Facebook status, tweet your ideas, using IPv4, what different it's going to make when the SP give you IPv6 instead, or tunnel your IPv4 across their IPv6 network? Are you willing to pay more if you are using "IPv6 infrastructure" to use the very same services like Internet? I bet you aren't. Superb picture from my mentor to show what most people (who work in computer networking area) think about IPv6 address. So why do the Internet or Service Providers need to invest in IPv6 while most of their users don't even care? 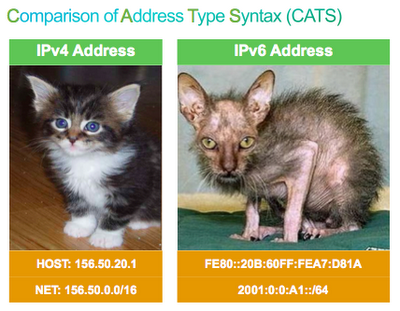 Because IPv6 is not for human being. It's for the "things." All the things that need to connect to the Internet. PC, smartphones, tablets, wifi routers, IP cameras, IP phones, home appliances, sensors and any IP based devices. In 2008, the number of things connected to the Internet exceeded human being population. Cisco predicts in 2016 the number of Internet devices is three time the population. So let's say 15-16 billion devices. And they all will need Internet Protocol (IP) address. That's only 4 years from now. And since IPv4 theoretically can only provide 4 billion total IP addresses (if we can use them all) while IPv6 can provide 340,282,366,920,938,463,374,607,432,768,211,456 addresses, with IPv6 we can even provide 100 to each atom on the face of the earth. Check out the nice infographic from Cisco for this. And welcome to the Internet of Things. I am a regular reader of your blog posts(particularly all related to CCIE) and I passed RS in 2009.working with MNC in India. Thank for inspiring me with your"life in Cisco's lane,and beyond"
P.S. - I know my comment has no relevance to the current post. Its - Nice Meeting You Always!